The 2014 Melbourne Cup has been won by Protectionist, following a strong sprint to the finish ahead of Red Cadeaux and Who Shot Thebarman. Admire Rakti took an early lead, followed closely by My Ambivalent. Fawkner featuring at the front as well. My Ambivalent made a breakaway heading up to the 1300 metre mark, but was chased down by Admire Rakti. As the horses hit straight, the race favourite Admire Rakti dropped off, finishing the race in last place. Red Cadeaux took the lead in the sprint to the finish, but it would be Protectionist with an incredible burst of speed that would race away to claim Germany’s first ever Melbourne Cup. The 2014 Melbourne Cup runs at 3pm (AEDT) and we’ll bring you live updates, winners, losers, and all the results, plus all the late mail as Australia’s richest and most historic race gets underway. Preview: The Melbourne Cup at Flemington in Melbourne offers the 24 entrants $6 million dollars in prize money on offer in this two-mile (3200m) global event. The race isn’t an easy one to get into – Gai Waterhouse, who won for the first time last year with Fiorente, doesn’t have an entrant. In terms of the race itself, we will see horses like Mr O’Ceirin, Opinion, Brambles and Au Revoir race to the front early. They’ve all drawn wide and need to find a place in the running before the first bend. Signoff could also push forward, along with Willing Foe. Fawkner and Admire Rakti will both settle midfield from their barriers. All three are considered hot chances. Admire Rakti was extremely impressive in the Caulfield Cup and only rises 0.5kg off that run. Behind him were Lucia Valentina, who ran home well, and Junoob, who did not enjoy the best luck in the last 600m. Fawkner was been flying at weight-for-age this preparation and was a brave second in the Cox Plate. He ran well in this race last year and the stable have won two Cups recently off a similar campaign. The best of the internationals look to be the ones we’ve seen do well so far in Australia – the German Protectionist should improve off an unlucky run in the Herbert Power, and Mutual Regard showed superior staying prowess in the Ebor. Red Cadeaux, who has been so close to winning before, is back for a fourth crack and is flying according to all who have seen him. Araldo is a genuine chance, but has drawn barrier 24 and will need the most luck of any runner today. The internationals that will need a bit of luck include Seismos, who disappointed in the Caulfield Cup but may be better suited to the Flemington track. Royal Diamond is an old stager and might find these a bit quick, but he’ll be thereabouts. Gatewood has made a return to form overseas, but will that carry over to the Cup? The locals are led by champion trainer Chris Waller, even if his horses started their lives elsewhere. Who Shot Thebarman is one of the best credentialled stayers and he loves Flemington. Sea Moon and Cavalryman have been scratched in case you got them in a sweep – ask for a new horse! I can’t leave without mentioning the legendary Bart Cummings, who has Precedence in his quest for 13th Melbourne Cup and first with grandson James. As always, this is an open race where the size of the field and the number of good chances makes for a race where anything can and will happen. 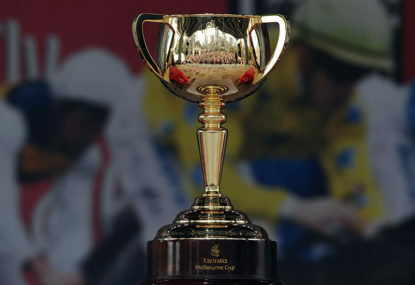 Enjoy this fantastic edition of the Melbourne Cup and happy punting. Stick with your head, your heart, your favourite number or your favourite colour. Good luck!